3- Wire Transfer. NEW FACTORY BOX. Cooler Master 2Ball CM12V CF00130100. Actual Item Shown In Images Above. Top Quality. 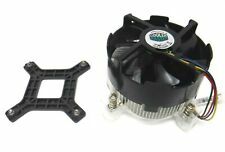 Cooler Master CM12V Fan w/ Heatsink Combo KDH-5067K (0437XQ) w/ Screws - VGC! Used and in great shape! Clean pull from a working unit. 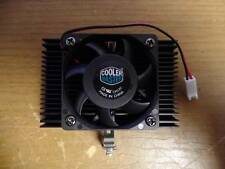 COOLER MASTER 393468-001 CM12V + HP 418803-001 FAN WITH HEATSINK, FREE SHIPPING! COOLER MASTER - Desktop Cooling Fan with Heatsink. HP - Tower Heatsink with Fan. EXCELLENT USED CONDITION . Cooler Master CM12V CPU Heatsink and Fan. Pulled from motherboard with an AMD FX-6300 in an AM3 socket when I upgraded my PC. Perfect working condition. 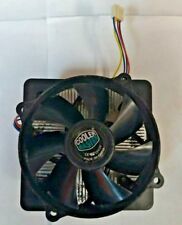 Cooler Master 4 pin CM12V KDH-5070N 0509XQ Fan With Heatsink Air Cooler LGA 775/Socket USED. Fan 12V CM12V Cooler Master. ASUS IPIBL-LB Motherboard Intel E3600 Heatsink & Fan Cooler Master TESTED FS! Model FA08025M12LPD. Interface 4pin. Size80 80 25MM. About logistics To the international . We can help you find the goods you need! Connector: 3Pin. Size: 120 120 25MM. About logistics To the international To the United States . DO NOT send without communication. A good used Cooler Master LGA 775 CPU cooler. Has an extension above the fan to allow it to draw in air from side panel of computer. This extension is removable if not desired. See photos. Base of cooler to top of air intake is APPROX.